Walt Disney once said that when he built Tomorrowland, he had to rebuild it because the American space program kept outstripping anything he could create as a vision. 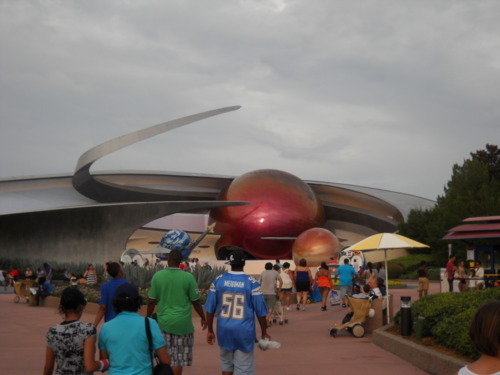 This past Friday, July 8, 2011, America stopped needing to rebuild Tomorrowland. When I was a child growing up, all my heroes were astronauts. I so much wanted to be one, and when my eyesight went bad enough in the 4th grade that I started needing glasses, I was inconsolable. I knew I was never going to go into space. Astronauts didn’t wear glasses. Over the years, I’ve watched the space program with growing trepidation. Instead of making bolder steps forward and outward, we seemed to be making strides backward, closer and closer to Earth. With the International Space Station, we were at least committing to a long-term presence in space, but even that was tenuous – a handful of people, dependent on the frequent ferrying of supplies – not a true colony, more like an outpost that was planned for eventual obsolescence. What was worse, we seemed to have no future vision. Unlike when America had committed to the shuttle program before the moon landings had ended, successive presidents of different political parties had turned NASA into a political football, each not wanting to carry forward the vision of their predecessor. Thus, when the previous president announced the retirement of the shuttle program in 2006, he also laid out a vision for a new booster program designed to have Americans into space again within 12 months of that date. One of the first acts of the current administration was to confirm the end of the shuttle program but to cancel the end of human spaceflight into earth orbit by NASA. We would now have to buy our way into space, either from other governments or private contractors. Unfortunately, none of those contractors are anywhere near ready to even begin ferrying cargo to the International Space Station, let alone people. We have bet on, in a term from a previous industry I worked in, vaporware – it just doesn’t exist. 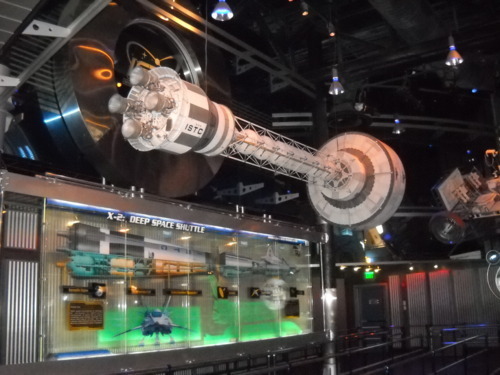 Walt Disney always believed in space travel, making sure that Disneyland had a Mission to the Moon attraction. 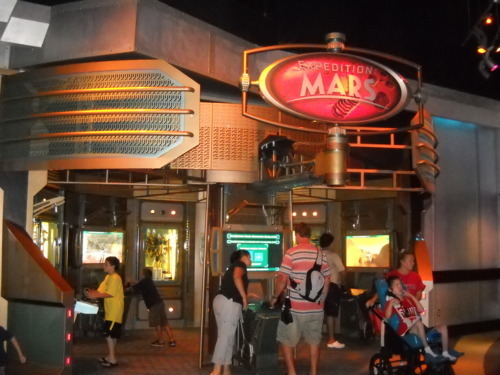 Walt Disney World’s Magic Kingdom opened n 1971 with a Mission to Mars attraction. The general public has always had a great fascination and imagination when it came to outer space. It has dominated our entertainment over the last half-century. But that’s the only place it seems it ever will. 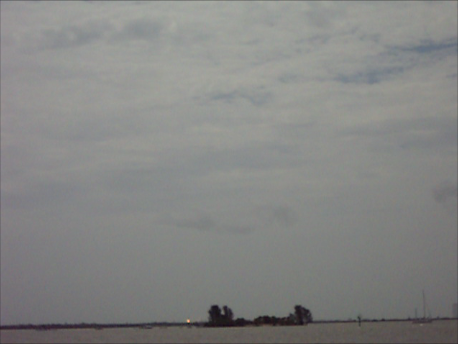 On this morning, I knew I had one last morning, one last chance to see the space shuttle launch. NASA convinced Congress to add one final mission to send up one more load of supplies, to basically cram the ISS full to the gills, knowing that the promises of private rocket delivery of supplies were still just that – vague promises. I knew I had to go. So, at 1:30 in the morning, I joined 1 million of my close, personal friends and headed to Titusville, the nearest town to the Kennedy Space Center. A check online gave me a couple of viewing locations, and 90 minutes later, I was ensconced on the seawall near Veterans Memorial Pier. I had breakfast, a chair, a camera, and 8-1/2 hours to wait. Of course, even that was iffy. The weather forecast said there was only a 30% chance the shuttle should lift off. 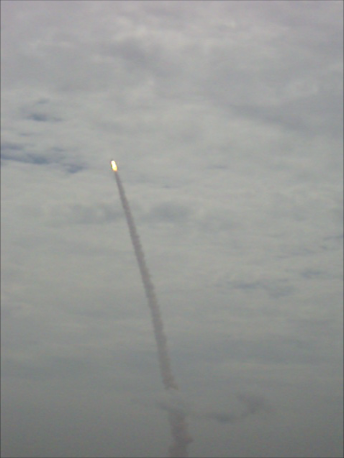 There were rain and clouds in the forecast – and there needed to be clearings enough for the shuttle not just to launch, but to return safely if something went wrong. Still, when I arrived, people were optimistic. The weather showed rain off the coast, but it was heading north not west. There was a breeze of about 15 miles an hour so winds might be an issue, but they could blow the clouds out. The weather was just going to be iffy up until launch time. It was going to be a gamble. Since I had quite a bit of time until the launch, some quality napping was in order. So I set the alarm on my cell phone (two actually – including a crowing rooster at 100 decibels), and off to sleepy land I headed. My Chevy HHR is useful for many things, but sleeping is not one of them – my back would remind me of that the remainder of the day. But I awoke four hours later to the melodious tones, a lighter grey sky, a much heavier crowd, and to my surprise, a fully open and operational tiki bar nearby. I have to tell you, if you are going to celebrate the end of an era, having a tiki bar helps – especially one that serves up a very mean and tasty breakfast burrito with a bon-diggity four-alarm salsa to go with it. The frozen margarita helped to thoroughly quench that fire, though. Sated and satisfied, I settled in to wait for the launch, still three hours away. 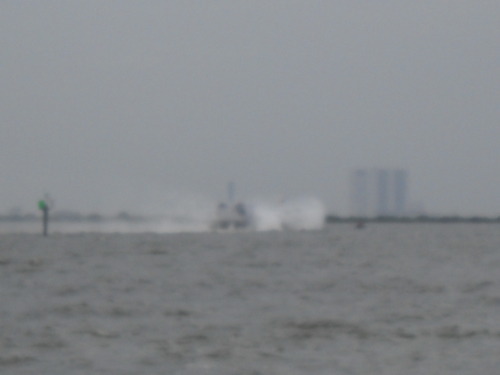 The Indian River was choppy, and I had to admire the brave souls who were trying to watch the launch from their sailboats –to me, that seemed like a sure fire way to seasick city. Although, about an hour into waiting, along came one boat that probably could have ridden out the waves in style – a hydrofoil. As for comfort…well, it made so much noise and threw up so much spray, I couldn’t see how anyone inside could see or hear anything. Occasionally, we would also have an overflight by a helicopter, there to document the size of the crowd on this historic occasion. Having been in a crowd video before, to me this was a no big thing, but the crowd went wild. Go figure. 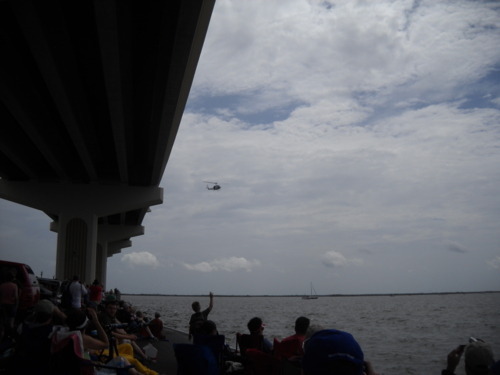 News choppers from Orlando stations, Tampa stations, Jacksonville stations, and even an official NASA chopper did a fly-by. One of the gents seated in front of me had his computer with him and was monitoring the NASA website and video feed, as well as the weather radar. Honestly, the weather was really looking good – clouds were starting to break up, and we spotted the occasional blue patch here and there with no rain shadows anywhere. Our computer dude showed rain only 100 miles out to sea but heading north – no drift to the west at all. 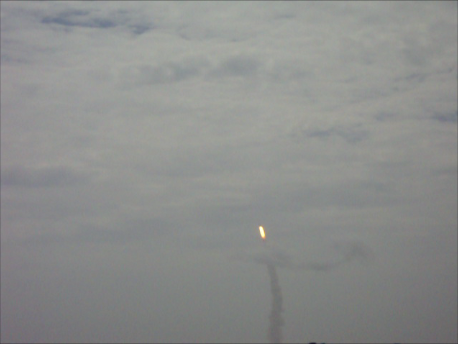 Suddenly, NASA upgraded the launch possibility from 30 percent to 60 percent. With that, I grabbed my portable radio, plugged in my headset, and tuned to the local AM station that covered the NASA public address broadcast. Since NASA had been on a scheduled hold at T minus 9 minutes, it was a question of a go-no go for launch based on weather – and the launch team decided they had a window. At 11:17 a.m., they restarted the clock. 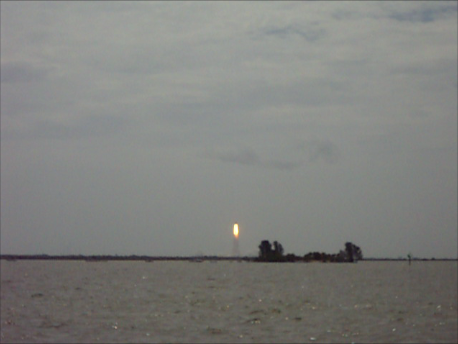 ATLANTIS WAS GO FOR LAUNCH! It was as if someone has sent an electric shock throughout the crowd. Suddenly everyone was on alert. Cameras and telescopes were manned. 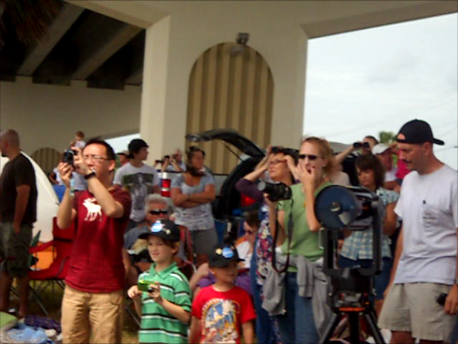 People moved to edges of the seawalls, children were placed on parents shoulders. Folks opened up their cars or tuned in their stereos so that the crowd could hear the official NASA broadcast and share these moments of the countdown. Everyone had the same thoughts, the same words we’d all seen on the way into Titusville this morning running through our minds: God Speed Atlantis. A collective groan rose from the crowd. Had this most complicated of machines ever created failed again? As I listened, technicians in the control room analyzed the error and called for “camera 56” to swing into position. It seemed that a sensor sounded an alarm that a hose disconnect had failed at the last second, keeping Atlantis tethered to the launch gantry. 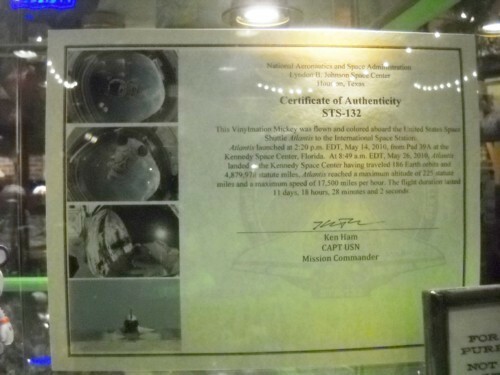 Yet according to the technicians, this was a false reading – the camera showed the hose retracted and the hatch on the Atlantis closed and locked. After a moment’s conference, the decision was made – resume the countdown. I let out a whoop and yelled the information to the people around me. … followed suddenly by a beautiful sight. The spacecraft leaping upward, arching over on its back on a pillar of flame and smoke. The rumble of sound already starting to reach us from the launch, as the ship climbed behind the lower layer of clouds and up to the ceiling. Then, within forty seconds, it passed through the cloud deck itself and was lost to our sight. In another thirty, it reached the sound barrier and crashed through it, its twin sonic boom reaching back to us in a crash of sound and air pressure. With that, it went hypersonic and was gone, a simple memory of contrail already starting to dissipate in the winds of the Cape. As soon as it was one, people immediately packed up, hoping to beat the crowds out of the area. I, on the other hand, approached that as a futile exercise. A million people were here to see the launch of Atlantis. It took eight hours to bring us all in – it would take nearly that long to clear us all out. I headed to the tiki bar for a teriyaki burger and another frozen margarita. Oh, how I wish that we still had that resolve as a nation as well. Out front, the building is an inspiring design – soaring, sweeping curves, large recreations of planets and solar system – and warning signs. Lots of warning signs. 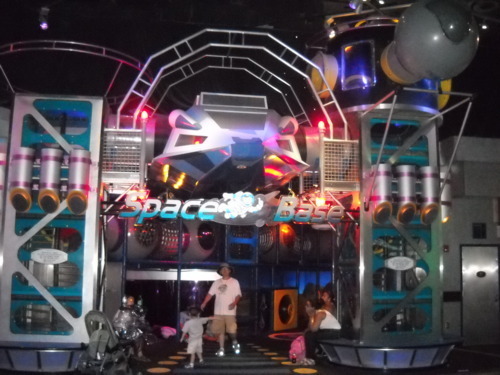 Mission: Space is a centrifuge that spins you at 2.5 times the force of gravity during a portion of the ride – which can be disorienting. Especially since your visual field doesn’t change. People do get sick on the ride, so motion sickness bags are available. 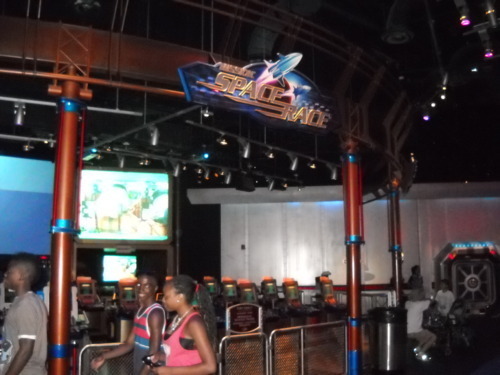 You have two choices of rides – Green, without the centrifuge, or Orange, the full experience. This change was made after there were two deaths on the ride, both due to pre-existing conditions. I opted for the full boat option since I like to live life to the fullest. As I say, I’m all about the intangibles. This is a FastPass ride, but since I’ve arrived at 8 p.m., there was no line for the ride. 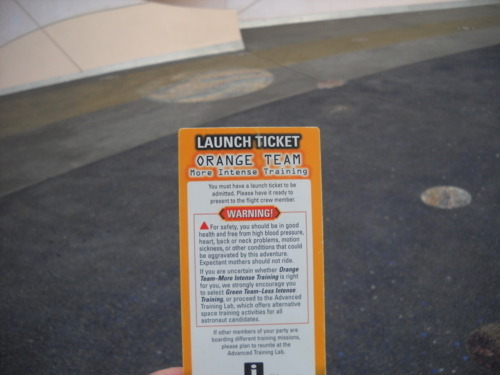 I went straight through the queue area, so I had no time to appreciate items like the gravity wheel replicating the one used in the movie Mission to Mars, the plaques on the walls commemorating space missions past, present, and future, the replica moon rover or X1 and X2 Mars Spacecraft. As I reached the end of the queue, I handed in my Orange Team pass and was directed to one of two ready rooms on the right (the pair on the left are for the Green Team experience). Once inside, I was assigned a space in the floor corresponding to a team number. This would be my simulator assignment. As soon as the room was full, the doors slid closed, and our briefing began. 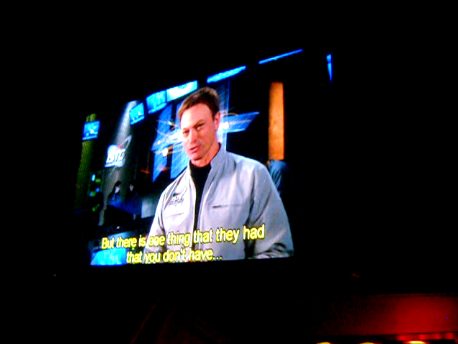 We were informed by Gary Sinise, playing his same astronaut part from Mission to Mars, that we were embarking on an important role. 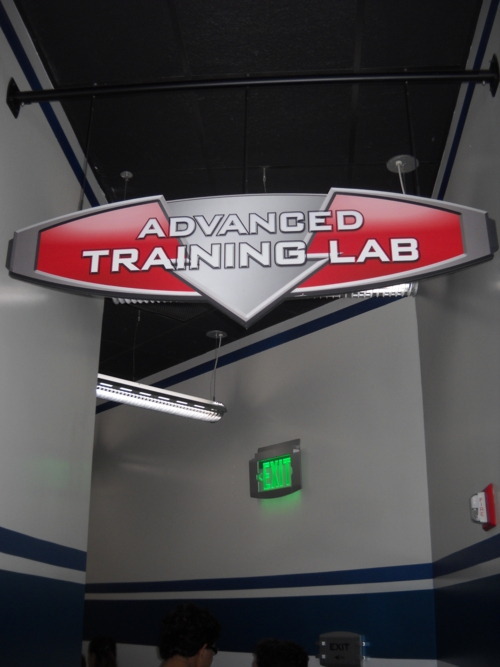 An explanation of the training we would face was again given, and for what seemed like the fiftieth time, we were warned about the possible risks from the centrifuge. We were then instructed on how to board and what we would do. Once that finished, the doors to the simulator room opened up, and the ten groups of four filed in, two sets at a time. As we settled in place, each team member was given his or her final crew assignment – commander, pilot, navigator or engineer – based on the position they were standing on. Our final briefing occurred at the same time the current occupants of the simulator were completing their session. Once they were finished, the simulator clam shell opened, and we climbed aboard as they exited the ride vehicle. As we settled in, we stowed our gear (and located the motion sickness bags, just in case. The instructions were to sit back, head against the headrest, as the shoulder restraint came down and held us safely in place snugly. Hopefully, no one had any clavicle injuries, because I could see how that could hurt a shoulder – the pressure was pretty secure. The ride started, we tilted back, and the countdown went from ten to zero. I closed my eyes, and though for a second, again… Godspeed, Atlantis… and then we were off. I know this was not quite what the astronauts on board Atlantis felt, for although I was pushed back in my seat for approximately 20 seconds, I also felt a rotating motion and the first taste of vertigo – not a pleasant experience. But for me, it was close enough. For one moment, I felt a kinship with them – a shared moment – a flashback to the nine-year-old who so wanted to go into space and explore the boundaries of the cosmos. As we reached the apex of the climb, the “pilot” reached out and pushed a button that supposedly cuts off the engines. The program stops the centrifuge from accelerating, and Sir Isaac Newton takes over. You are accelerating faster than the surrounding container for a moment, so for a moment you are floating above it… thus you feel like you are “floating” or weightless. In some cases, it is a very cool effect. The rest of the ride is a typical motion simulator – twists, turns and a couple of moments of acceleration, but nothing else as intense as the liftoff. Toward the end of the ride, you have a harrowing landing, complete with a literal cliffhanger of an ending. Then you are congratulated on your arrival, and presto – four minutes after you started, you are now a member of the manned space program. Oh, if it were merely that easy. Oh, that’s right. We don’t have a future in space in the real world anymore, according to Disney. Only in entertainment, in fake space. 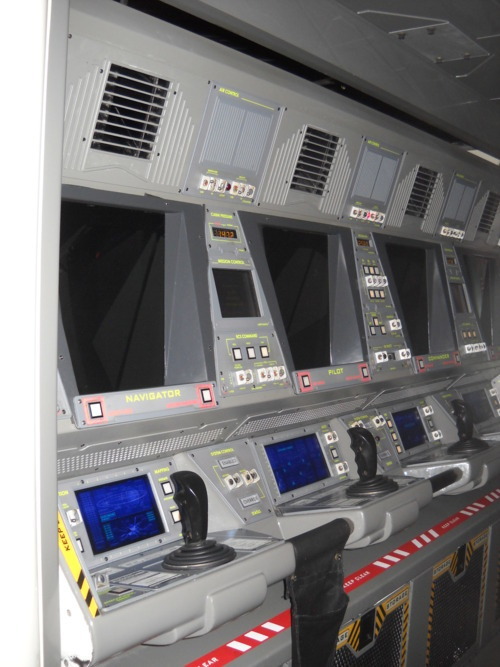 … a Space Race game that has two teams of four controllers race a pair of X2 ships to Mars. A couple of bored castmembers were halfheartedly attempting to attract guests to play the game without any success – my guess is they had been trying for hours, and no one had wanted to. It seemed as if they’d all but given up. There was also a single player Mars explorer games, where you help an astronaut find five other stranded astronauts on the surface before time runs out. In other words, a video game version of hide and seek. And finally, a video postcard setup where you can green screen your head into a video postcard and send it by email. Yet another gimmick. Nothing to educate people with. Nothing to teach anyone about the wonder of actual space exploration at all. Just as America has given up trying to inspire people with a vision of the future through our quest to space, so too has Disney. 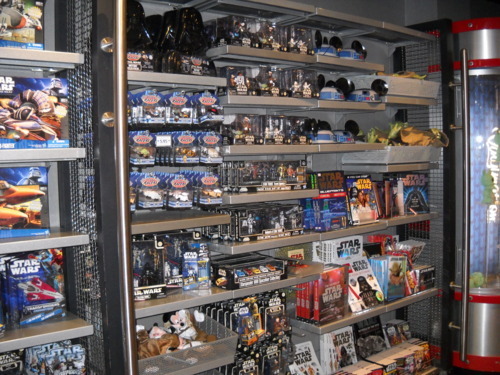 Even the gift shop at Mission: Space doesn’t feature anything related to real spacecraft or NASA – only Star Wars. Just fake space. 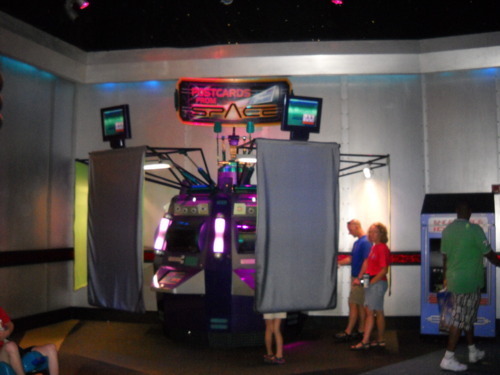 In fact, the only real, space-related artifact that I know of on the entire Disney resort property isn’t at Mission: Space. It’s at Downtown Disney West Side. Specifically, it is on display at D-Street, a store there. 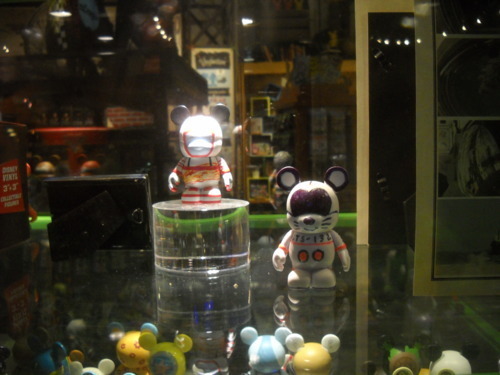 In 2010, a pair of Vinylmation figures went into space with astronaut Ken Ham, ironically aboard the Space Shuttle Atlantis. I guess you could call it one small step for Disney merchandising. As I walked away from Mission: Space, I looked over my shoulder and wondered. If Disney chooses not to show us the wonder and the possibilities of that sort of future, will anyone ever again? Does it even exist for us, as a nation, as a people? Have we, as a whole decided to give it up? Ron, don’t fear the future! It’s a choice we must choose to make, as a people, as a nation. We need to believe in a better world. What happened on Friday was a setback, but it’s not the final chapter. Especially not if I have anything to say about it.